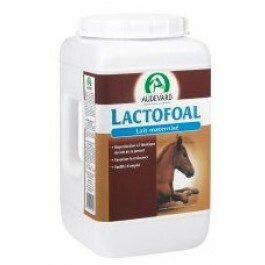 For orphan foals, in the event of inadequate lactation in mares or where post-weaning nutrition is required, it is essential to have a milk formula specially formulated for foals to hand. The Lactofoal formula is suited to the specific needs of foals: the correct protein and fat content for horses, optimal protein quality and pro- and prebiotics. It comes in powder form that fully dissolves in water. As the foaling season approaches, remember to have a tub to hand. The barrel format is practical and economical for use over long periods. Lactofoal can be added to the daily feed for the first two months of weaning. Start with 500g and reduce gradually. Analytical constituents:Humidity < 10 %, crude protein 21%, crude fats 15%, crude ash 11%, calcium 0.90%, phosphorous 0.70%. Milk formula for feeding and weaning orphan foals, to supplement feeding in the event of inadequate lactation in the mare, and for post-weaning. Dilute 2 measures in 1 litre warm water. Shake well until the mixture is smooth. - Day 10: 12 litres of milk per day (2 litres every 4 hours or 25% of live weight of reconstituted milk per day), 1 month: 15 litres of milk per day (3 litres every 5 hours). Switch gradually to dry feed between the 3rd and 4th month to wean the foal. Complete feed for post-weaning in foals: Pour 10 measures of LACTOFOAL onto the foal’s feed each day and reduce quantity gradually.